Kaulonia in Bruttium. Silver stater (Nomos) ca. 475 to 425 BC. Denomination: Silver stater or didrachm (nomos). Date: ca. 475 to 425 BC. Size: 19.5 x 21.5 mm. Weight : 8.08 grams. Reference: Sear-462. HN Italy 2046. NOE Group F (84), same dies. Grade: gVF with a nice strike and reasonably well-centred for the issue. 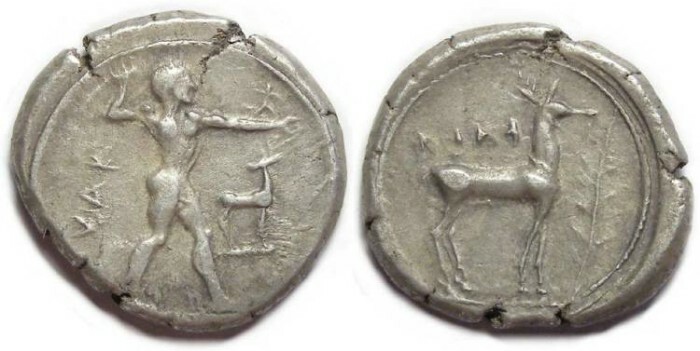 Obverse: Apollo walking right holding a laurel-branch, with a small figure standing on his arm (the small figure is not visible), with a small stag standing in the right field, with a retrograde KAVL to the left of Apollo. Reverse: A stag standing right with a sapling growning in the right field, with a retrograde KAVL above the stag's back (the inscription is slightly weak due to some wear to the die). This type is rather odd in that the ethnic for the city occures on both the obverse and reverse dies, but for some reason the early coins of this city often show this.